The Coffeyville Resources Nitrogen Fertiliser plant in Kansas, USA has adopted innovative belt cleaning, alignment and modular chute technology to resolve tracking, spillage and dust problems on two conveyors transporting petroleum coke (petcoke). Martin Engineering redesigned the system with belt stabilisation and chute sealing technology, sensitive belt tracking equipment and heavy-duty primary and secondary belt cleaners. Operators report considerably less carryback, no tracking issues and a significant reduction in fugitive dust and spillage. As a result, the only plant in North America to use petcoke gasification to produce hydrogen – a key ingredient in the manufacturing of ammonia and urea ammonium nitrate (UAN) fertilisers – estimates that the facility is saving more than US$14,000 per month in labour costs alone. A wholly owned subsidiary of CVR Partners LP, the facility produces about 388,900 tons of ammonia and 963,700 tons of UAN each year. One of the primary issues operations technical superintendent, Marc Gilbertson, wanted to address was material containment, to reduce the amount of dust and spillage that escaped from conveyors 19A and 19B, each 300ft long with a 24in wide belt. Travelling at 400FPM (~2 MPS), the belts carry an estimated 1400 TPD (3,080 kilos) of petcoke to an entrained flow gasifier. “We were seeing waist-deep piles accumulating each day, which required an average of about 90 man-hours per week to safely clean,” Gilbertson explains. In addition, the operation invested another 16 hours of equipment maintenance time each week. The company’s proposal included upgrading both 19A and 19B transfer points to eliminate belt sag, provide effective sealing and improve belt cleaning, as well as alignment systems to deliver continuous adjustment and maintain a consistent belt path. Technicians first installed three Martin Impact Cradles, located under the belt in the loading zones. The cradle design features a bed of steel angles lined by energy-absorbing impact bars with a top layer of low friction, ultra-high molecular weight (UHMW) plastic. After the impact zone, a series of 16 slider cradles were installed on each conveyor to stabilise the belt line and eliminate bounce. Designed for conveyor speeds up to 700 fpm (3.5 m/sec) and belt lengths of more than 50ft (15.2m), the units offer a flat and stable belt surface throughout the settling zone, reducing fugitive material and extending belt life. 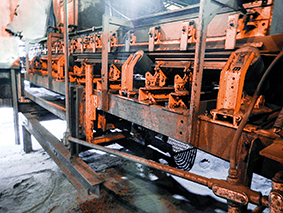 Following the cradles, 20 Trac-Mount Idlers were installed on each conveyor. These rugged idlers have sliding frames on a stationary base that fits in tight spaces between belt support cradles for easy installation and service. The system upgrade also included 90ft of modular chute wall. The pre-fabricated components make it easy to design and install transfer points and stilling zones to manage air flow and keep airborne dust inside. The components simply bolt together to reduce installation labour and replacement time. technicians also installed 184ft of the company’s ApronSeal Skirting System, which provides dual-seal efficiency with a single, one-piece sealing strip to prevent the escape of fines and dust. It incorporates a primary seal clamped to the steel skirtboard to keep lumps on the belt and a secondary or “outrigger” strip to capture any fines or dust particles. The mis-tracking belt issue was addressed with a Martin Tracker system to deliver immediate, precise adjustment of wandering belts. Using innovative multiple-pivot, torque-multiplying technology, it detects slight misalignments initiated by unbalanced loads and fouled rollers, using the force of the belt to immediately adjust its position and realign the path. The tracker keeps the belt in alignment with automatic corrections to reduce edge damage, prevent spillage and maintain belt health. 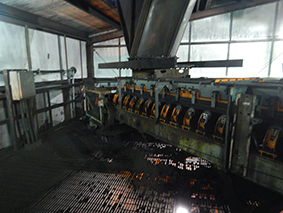 To address the issue of carryback, technicians installed a two-stage belt cleaning system. The primary unit is the QC1 Cleaner HD blade. Engineered for head pulley diameters from 12-24in (~305-600mm), the QC1 HD is suited for belts from 18-96in wide (~400-2400mm) and speeds up to 900FPM (4.6 m/sec). The unit’s patented constant angle radial pressure (CARP) design maintains cleaning performance through all stages of blade life, and the rugged 3/8in. (95mm) steel tubing main frame holds the cleaner snugly in place. Mounted directly after the primary cleaner, the Martin SQC2S secondary cleaner features individually cushioned tungsten carbide blades for effective cleaning without risk to the belt or splices. Patented rubber buffers maintain the cleaning pressure throughout blade life. Like the QC1, blade removal and replacement is a simple operation by removing the lock pin and sliding out the cartridge. Plant officials are extremely pleased with the outcome, which has drastically reduced the amount of dust and spillage, and with it the unproductive labour time to deal with the consequences. 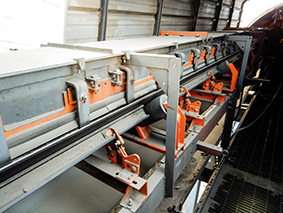 Gilbertson estimated that the total maintenance time to manage fugitive material on both conveyors is now down to about eight hours per week, with belts and other components no longer showing signs of premature wear. In addition to the estimated US$14,000 per month labour savings, longer service life from belts and components are expected to further increase the benefit. Moreover, company personnel spend less time working in close proximity to the moving conveyor, reducing potential risk, and the manpower savings can be applied to more productive activities. “We’re very happy with the results,” Gilbertson states. “What used to be a huge maintenance task is now just occasional sweeping.” The Coffeyville facility is already considering proposals to upgrade additional conveyors, as well as future training and service agreements.